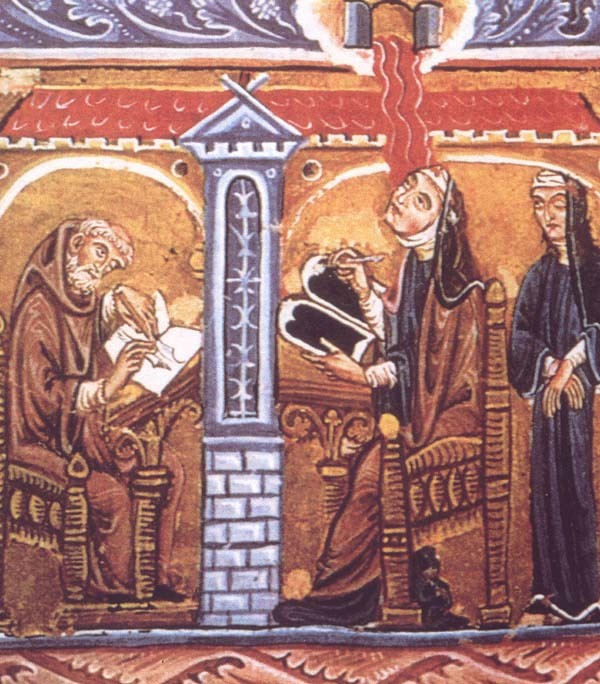 St. Hildegard of Bingen prefaced each of her three visionary-theological works—the Scivias, the Liber Vitae Meritorum (“Book of the Rewards of Life” / “Book of Life’s Merits”), and the Liber Divinorum Operum (“Book of Divine Works”)—with a brief description of the chronological and visionary genesis of the work. Although a little longer than the opening of the Liber Vitae Meritorum—whose structure it nevertheless parallels—the Prologue to the Liber Divinorum Operum is only half the length of the Protestifactio that opens Scivias. 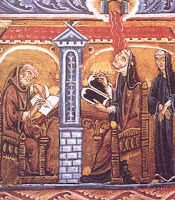 Because that first declaration came at the beginning of Hildegard’s writing career, at a time when she was still quite unsure of herself, it went to great lengths to establish both Hildegard’s frail humility in the service of God and the legitimate, divine authority for her prophetic messages, as well as the dynamic of the visionary experience relating the two. 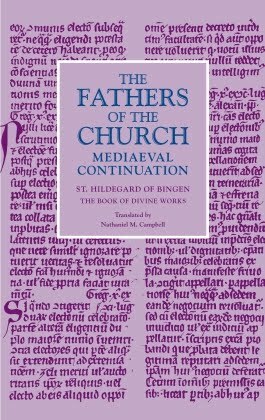 The openings of the latter two works also take up those three themes that are central to Hildegard's visionary, prophetic, and theological vocation, but with greater concision. Its message about the works of God is to be useful or advantageous to humankind (ad utilitatem hominum). Humans have a fundamental vocation to understand the work of God (of which they are the pinnacle), for only through such understanding can they know their creator and properly fulfill the work for which they were created. Both the entire work of God and the Liber Divinorum Operum’s own explication of that work is entirely held within the foreknowledge of God from eternity. And it happened in the sixth year after the wonderful and true visions, on which I had labored for five years when a true vision of the unfailing light had shown to me, a human being, the diversity of various morals, of which I had been quite ignorant: that was the first year and the beginning of the present visions. When I was sixty-five years old, I saw a vision of such mystery and power that I trembled through and through and then fell ill because of the weakness of my body. After seven years, I have finally brought this vision almost to completion by writing it down. Therefore, I, a poor and feeble form worn down by many infirmities, have at last turned my trembling hands to writing. This is witnessed by that person whom I had sought and found in secret, as I have related in my previous visions; it is also witnessed by that girl of whom I made mention in my most recent visions. As I have done this, I have looked to the true and living light to see what it is I ought to write—for I came to know everything that I had written of my visions from start to finish as I kept watch upon the heavenly mysteries in both body and mind. I saw everything with the inner eyes of my spirit and I heard everything with the inner ears, and not in dreams or ecstasies, just as I affirmed in my previous visions. With truth as my witness, I have not offered anything of human sentiment, but only those things that I perceived in the heavenly mysteries.